This Vilambazham pachadi/Wood apple sweet pachadi is a delicious as well as healthy dessert made out of Wood apples and Jaggery. 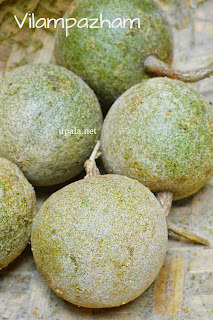 Vilambazham (Wood apple/Bael fruit) is one of the forgotten fruit which has lots of health benefits. It has a hard shell outside, and the pulp part inside which is only consumed. 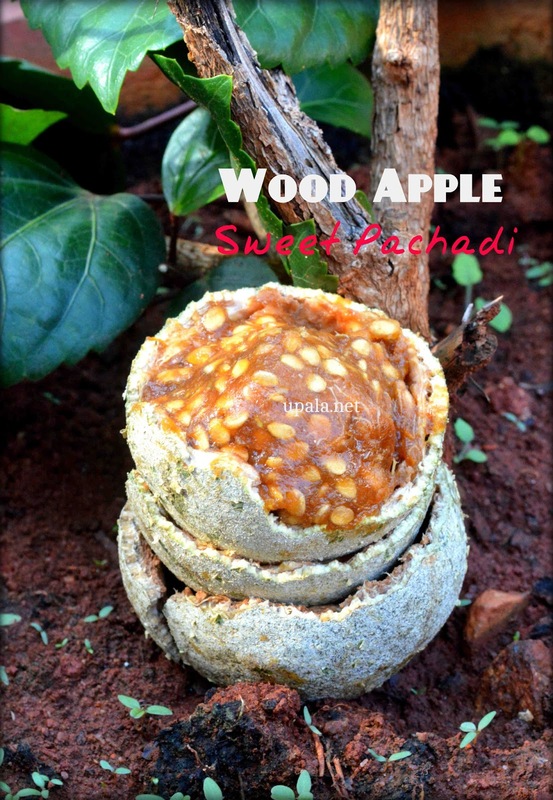 The other names for this fantastic fruit are Elephant apple, Monkey fruit, Curd fruit, Kaitha (Odiya), Belada hannu, Vellaga pandu, Koth bel, Kaitha, Kothu. 1) Break the hard shell and Scoop out the pulp from wood apple. Transfer the scooped pulp to a bowl. 2) Add jaggery and cardamom powder and mix well. You can add little water to get pachadi (jam) consistency. 1) To find ripeness, drop it from 2 feet height above the ground. The unripe one will bounce like ball and ripe one will not. Then you can break it to make pachadi. Also the pulp will get separated from the shell when its ripe, this can be found out by shaking it. Does vilampazham ripen at home (if purchased unripened from the store)?